The Hermitage museum brings to an end its 250th anniversary celebrations with Francis Bacon exhibitions in Russia and the UK. Both show the artist's work from UK collections alongside objects from the Hermitage that inspired him. Twenty-five canvases by one of the most prominent contemporary artists are on show in St. Petersburg until March 8. 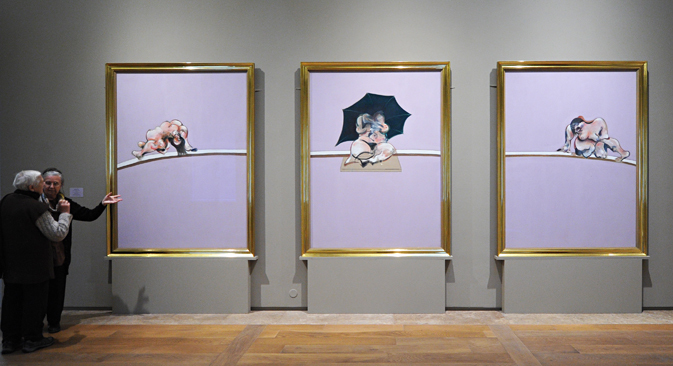 The paintings are part of an exhibition Francis Bacon and the Art of the Past on display at the newly reconstructed General Staff building, which provides additional space for Hermitage exhibitions. The artist's work is shown accompanied by photographs and other items from his studio. But co-curator Thierry Morel’s most outstanding novelty is the juxtaposition of Bacon’s paintings with masterpieces of the past, from ancient Egypt to work by post-Impressionists, all taken from the Hermitage’s collection. “My experience working with the Hermitage this past year has been extraordinarily enjoyable,” Morel said. Last year, Morel collaborated with Russian colleagues to stage an exhibit in Norfolk Houghton Revisited: The Walpole Masterpieces from Catherine the Great's Hermitage, where old and new pieces were on show together. “So I was glad to offer the Bacon exhibit project to this great museum during the year of its anniversary,” he added. Bacon’s earliest painting at the exhibition is Crucifixion, which he finished in 1930. It is one of the few surviving works of his early period; in a fit of self-criticism, the artist later destroyed the majority of his paintings from that time. Bacon’s subsequent work up until 1970 is well represented at the exhibition. There are not enough later paintings created in the last two decades of his life to provide a full retrospective, but the selection does provide an excellent presentation of how Bacon’s creativity evolved over time. Such parallels were selected for each Bacon canvas on display at the exhibition. For example, Rembrandt’s Two Old Men brings a fresh perspective to Bacon’s paired portraits of Lisa and Robert Sainsbury, while Van Gogh’s variations on Millet play upon Bacon’s variations of Van Gogh. In April, the exhibition will move to the UK's Sainsbury Centre for Visual Arts at the University of East Anglia, the main partner and contributor of half the paintings. The exhibition, which runs there April 18-July 26, will continue the idea of comparing Bacon’s work with the art of the past. However, this time the concept will be displayed differently because some older masterpieces cannot be removed from the Hermitage. “All of the Hermitage items except the large and heavy fragments of antique sculpture, The Sleep of Endymion, work by Michelangelo, two Van Goghs, and the Degas pastels, will go to the exhibition in England. The Hermitage never sends those items to exhibitions,” Renne said. Still, British spectators are likely to be surprised by the variety of masterpieces from the Hermitage collection, including sculptures by Bandinelli and Bernini; works by Titian, Velasquez, and Rembrandt; Cezanne’s self-portrait; and pieces by Matisse and Picasso.